Markings: The left side of the dust cover is marked “UNITED STATES PROPERTY”, the right of the frame is marked “No 315216”. The right side of the slide is marked “MODEL OF 1911. U. S. ARMY”. The left side of the slide is marked “PATENTED APR.20,1897. SEPT.9,1902 / DEC.19,1905. FEB.14,1911. AUG. 19, 1913”,with a Rampant Colt logo and “COLT’S PT. F.A. MFG. CO. / HARTFORD, CT. U.S.A.”. The rear of the slide is marked “H”. The left side of the frame is marked behind the trigger with an eagle’s head over “S8”. The top of the frame is marked “8” to the right and in front of the feed ramp, “S” and with another mark in front of the disconnector and “G” behind. The left of the barrel’s link-lug is marked “P”, the right is marked “HS”. Stock Configuration & Condition: The grips are checkered walnut with smooth diamonds around the grip screws. The grips have moderate handling wear with some marring in the checkering on the right panel, some smoothed checkers on the left panel at the bottom-front and scattered light compressions. There are no chips or cracks. The grips rate in about Good-Very Good overall condition. Type of Finish: The finish is blued. The mainspring housing is smooth. Bore Condition: The bore is a bright, the rifling is sharp. There is no erosion in the bore. Overall Condition: This pistol retains about 96% of its current metal finish. There are scattered patches of light surface erosion under the finish, on the top of the chamber and on the polished side faces of the hammer and trigger. There are a few scattered light marks, mostly in the fronstrap, mainspring housing and grip safety. The screw heads range from sharp to lightly tool marked with a strong slot. The markings are clear. 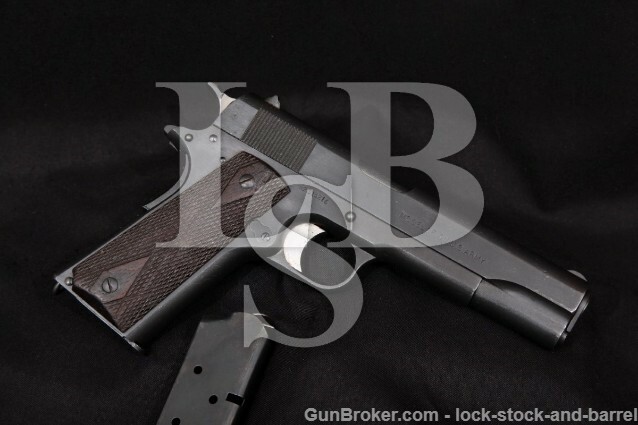 Overall, this pistol rates in about Very Good condition as refinished. Mechanics: The action functions correctly. It has both a manual and grip safety and the trigger pull is crisp. The slide has almost no play to the frame. We did not fire this pistol. As with all used firearms, a thorough cleaning may be necessary to meet your maintenance standards. Box, Paperwork & Accessories: This pistol comes with a single 7-round blued magazine marked “C-S” on the floorplate with light operational wear, intact feed lips and a strong spring, in about Very Good-plus condition. Also included is an 8-round blued magazine marked with rampant colt, “COLT / 45 AUTO / 8-RD” and “G” on the floorplate with little to no wear, intact feed lips and a strong spring, in Fine-Excellent condition. Our Assessment: The 1911 and 1911-A1 pistols served the military of the United States from 1911 to 1985, through two World Wars and the Korean and Vietnam wars. They gained a reputation as a reliable handgun with plenty of stopping power, and are held in high regard by those who have used them. This is a U. S. Government marked Colt 1911 pistol made toward the end of WWI in 1918. The pistol is in about Very Good condition as refinished with some scattered light erosion under the finish, strong mechanics and a great bore. The barrel and some other small parts appear to have been replaced, but overall the gun is a good-looking 1911. This pistol would be great for home recreational shooting or for shooting in the Traditional category at SASS Wild Bunch matches, but WWI Colts are very collectable, and the shooters may not outbid the collectors on this one. Please see our photos and good luck!